With systems like the Kinect and Leap Motion, controlling a gadget with just the wave of a hand is starting to become much more commonplace. The one drawback to those gesture-based devices however is that you never actually touch anything. No matter what you see on the screen, you’re still very aware that you’re just moving your hands through the air. 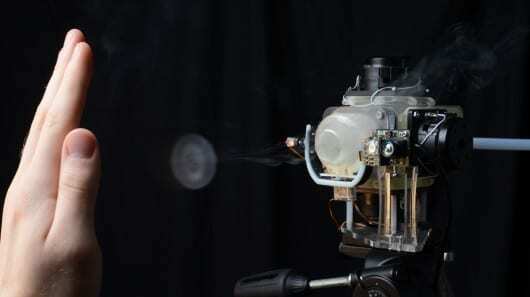 The Pittsburg branch of Disney Research may be able to change that with Aireal, a low-cost haptic system which fires out small rings of air that allow people to feel virtual objects. The Aireal system is comprised of modules that track a set target, such as a person’s hand, and produce controlled puffs of air that can hit their mark with pinpoint accuracy. When combined with a separate gesture-controlled system, like the Kinect, these bursts of air can be timed so they reach a user’s hands at the same moment as an on-screen object would if it were real. The research team has plenty of creative uses in mind for its new haptic technology. Besides allowing players to virtually feel the games they’re playing, Aireal could provide a physical sense of touch to more mundane actions, like cycling through buttons and menus on a screen.